This fall, in order to commemorate the new life-sized Unicorn Gundam in Odaiba, Tokyo, Bandai announced their latest additional the real grade line: the 1/144 RG Unicorn. Our contributor Henry, who you might remember from his seam line tutorial, investigates: does this highly anticipated model kit live up to the hype? A while ago, the reveal that the latest in Bandai’s excellent Real Grade line of kits would be none other than the Unicorn Gundam was announced to mixed reviews. 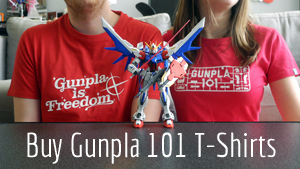 Many assumed the kit would be absurdly fragile, much in the same way people had previously seen with the RG Zeta Gundam, and other Unicorn Gundam kits even at larger scales. Accusations of the kit being a “grenade” that would fall apart in even the most delicate hands were flown around. How wrong we all were. The Unicorn Gundam in its standard, Unicorn mode—so named for its single protruding horn—doesn’t really look much like a Gundam at all, beyond that it’s humanoid. The two main colors here: a dark blue for the feet and backpack, and white for everything else- make the suit look a little plain, as if something is missing. When it engages its NT-D system, however, the more traditional aesthetics that we come to expect from the protagonist’s suit shines through. As with all Real Grade kits, the design has been retooled. Here, the focus leans more on realism than anime accuracy. This can be seen in the line’s signature color separation and impressive surface detailing on armor parts, all without the use of foil stickers for colouration. While it can be hard to see, there is definitely more than one tone of white in play, and the two tones of blue in the backpack and feet really help to bring out parts of the design. From every angle, this kit has detail to spare, even straight out of the box, snapped together. Metallic stickers are supplied for certain areas like the V-fin (though I painted mine) and the insides of the circular areas on the arm and leg frame, adding to the aesthetic. Due to the scale and its transforming gimmick which it does with no parts swapping, this kit does at some points involve some pieces that are on the small side, but everything fits together nice and securely. The worst offenders are found in the weapons that protrude from near the shoulders in Destroy Mode mode—they are absolutely miniscule and also clear pink. I can foresee many people losing these entirely. There are undergates featured on some armor parts to hide nasty nub marks, so look out for those when building, but other than that, I found the kit relatively simple to put together. The most daunting aspect is the frame runner—all RG kits feature a frame runner made of multi-colored pre-molded moving plastic, which require bending after being cut off their runners to ensure they’re not too stiff, but if you bend them too hard, too quickly, they can just break entirely! I’ve never had it happen, but ensure you’re not pressing on the wrong area before you snap armor parts onto it. I will say though—if you want to make your kit look like the one on the box and in the promotional images, you really should panel line it, put the marking stickers on according to the guide, and give it a top coating to protect your work. Those come with their own skill sets, obviously, but I really think the first two are super important for the look of this kit. You’d be doing all that surface detail a disservice not to! This kit features the best articulation of any Unicorn Gundam model kit in both its modes. The movement is not compromised by the transforming gimmick at all. The arms and legs are supremely bendy and the legs are not hindered by the skirt armor at all, allowing them to point in pretty much any direction. The best articulation to be found is in the shoulders—the arms pull out and forwards from the torso, allowing some great poses with the weapons. In addition, the frame that connects the two legs under the skirt armor can move down along a groove to allow for even more unhindered leg movement. As standard with the grade, you’ll find a tiny unpainted 1/144th scale figure of the pilot, Banagher Links, and a large sheet of marking stickers, featuring some metallic stickers that add to the look of the kit in certain areas. The unicorn gundam’s arsenal comes packed with a Beam Magnum and a Hyper Bazooka. Both of these weapons are cartridge fed, which can be removed at any time, and mounted to the back skirts of the Unicorn. These two weapons can also be mounted to the backpack, and the beam magnum can be put on the slots of either arm. A shield is included—and transforms just like the suit between two modes, attaching to the arm securely in one of two positions—at the back of the arm, and at the side. Clear beam saber effect parts are provided for the suit’s four integrated handles, two in the arms, removable, but also able to swing forward in Destroy Mode and shoot out at the same angle as the hands, and two on the backpack in destroy mode, and are held securely- and a total of six swappable hands are provided: a pair of hands to hold the weapons, open palm hands, and a pair of fists. The holding hands feature a tab that holds all the weapons securely without issue. In addition, if you want to display the suit in one specific mode, Bandai provides a fixed horn and V-fin, and stickers for the fixed V-fin, too. These can be swapped during the transformation process, although not noted in the manual—if you do not want to use the hinged splitting V-fin, which is a considerate addition. By now, just if it wasn’t obvious—I love this design and this kit’s incarnation of it. It’s absolutely the best version of the Unicorn Gundam for its scale, and maybe the most fully featured version of it as a model kit. It’s satisfying build process kept me engaged throughout and I love it in both of its modes. I struggle to find issue with this kit at all, and was totally blown away by that, as I expected it to be fragile and like a very pretty brick like its big MG brother—and instead found the most satisfying version of the transformation gimmick unique to the Unicorn, an extremely posable kit, and one packed with amazing detail that just looks great from every angle. I highly recommend this kit—even to people who have built a Unicorn in other grades—it truly delivers on the promise of the beast of possibility.